I just came back from a midnight premiere showing in Greensboro. And I want to start pouring out words like mad about how wog-boggled I am over how insanely excellent this movie is! But then I remember how it was that I went into seeing District 9, the first feature film to be directed by Neill Blomkamp (it's also produced by Peter Jackson). 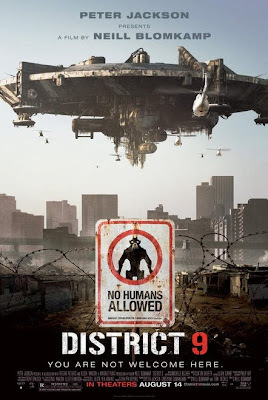 The first I ever heard about District 9 it was about two weeks ago, when the first word of mouth started trickling around the blogosphere about how this might turn out to be the best movie of the summer. I only really caught "aliens in South Africa" and how it was inspired by the history of apartheid in that country. And that's been it. Up 'til tonight I had seen not one television spot for District 9 or seen any trailers for this movie. Other than catching a look at the official posters here and there, I entered the theater to see District 9 as cold as a person could possibly be. And that's how I want you, dear reader, to see it also. Without knowing what to expect at all, or at least knowing as little as possible. There are too few good things in life that catch us unawares and leave us... how do I put this? I came out of watching District 9 all of those things and more. And I'm very much looking forward to seeing this movie again during the weekend, and possibly even once more after that. District 9 is the most original science fiction movie that I've seen in a very long time. And let's just leave it at that. Absolutely worth checking out during its cinematic run! Thanks for not spoiling it for me! Really looking forward to seeing this. I saw it this morning and you are right. If you've seen it don't talk too much about it to those who haven't yet. A movie this good doesn't come around often. I followed the ARG it had going online for a while, months before it was released. The ARG was fun, albeit not as fun as the Cloverfield one. I can't WAIT to see this movie. Seeing it tonight... Been staying away from any plot summaries/news about it, except for your blog. Thanks for not spoiling it. Looking forward to see it soon. Your buddy Phillip made my day by posting this. I'm surprised it has not been dugg more. Funny with major actors. This movie, is as good a movie as you will see this year any genre. Extremely well done on many levels. If there were any justice...every adult who saw Transformers II would go see this movie and discover how well written science fiction is supposed to be done. District 9 is to Transformers II as Professor X is to The Juggernaut-- one is big dumb unstoppable force that's cool to see burst through walls and stuff while the other is far more powerful on every level,and after you've seen the full scale of what he can do..It is in fact "mind-blowing"